If your desired size/color says "sold out", please call us at (866) 300-3311 to pre-order and reserve your Pace 500. 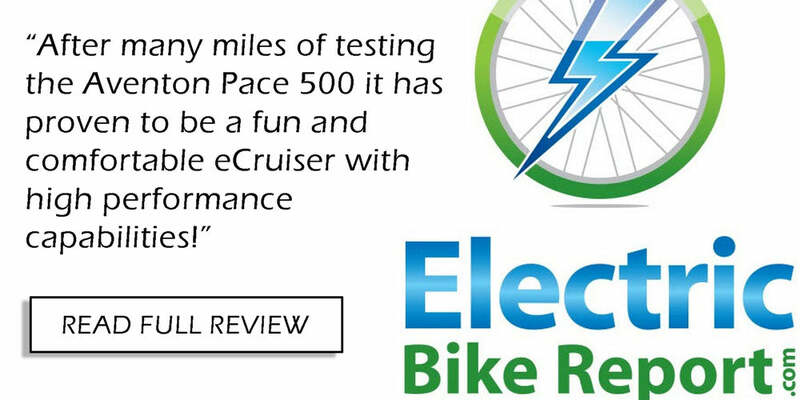 Keep up the Pace with our latest e-bike! This 28mph Class III e-bike maximizes fun and keeps you going on. It's like powering up your legs to make hills a thing of the past. With a 500W hub-drive motor and large comfortable tires, the Pace gives you the ultimate balance in comfort and power. With a relaxed, upright riding position and 5-levels of pedal-assist, this ride will keep the smile on your face all day long. Height 5'1" - 5'7" 5'7" - 5'11" 5'11" - 6'4"
This is my first bike in ages. I am using this for commute, and must say I couldn't be happier. The electric motor really makes tough hills easy, and the throttle essentially makes it like a slower mopad. For the price, I don't think there's anything that can match this bike on market. I have had the Pace 500 Step Through for almost a month. I have been commuting 14 miles round-trip in the chilly Minnesota (20-40F) climate. The Pace handles the environment wonderfully. It is a very comfortable ride and I am always pushing it to the max speed (28 mph). After my daily ride I typically have about 50% battery left, but it does depend heavily on the wind. I have about 155 miles on it and look forward to the next day's ride. I highly recommend this bike. This bike is more fun than humans should be allowed. I' love it even more than I thought I could and want to ride it everywhere I go. The customer service from Aventon has been stellar and they have been quick to answer any questions and resolve any issue. The world needs more companies with such excellent products and this kind of commitment to the customer. Well done Aventon!!!!! My wife and I both purchased the medium step-through e-bike (celeste and white) in March. I might have gotten the large but they do not offer the step-through in that size, but the medium works since I am a little under 6 ft tall. I am 70 years of age and recommend the step-through for older individuals. They are not just for girls. It is easier and safer to get on and off. Bikes ride great. Good quality materials. My wife had an issue with the left brake malfunctioning and the customer service was very responsive. Sent out a replacement part to the local shop in the area and they replaced the brake. The local bike shop was surprised to receive, not just the defective part of the brake, but the entire brake assembly was sent as a replacement. Shows a commitment to customer service. One caution, when you have the bike in an assist level of 1 through 5 and you then apply the brake, be aware that when you begin peddling it will give a jolt. If you have slowed down for some reason and then want to begin to peddle slowly at first you might not be ready for that sudden boost of energy; especially if you are on numbers 2 through 5. Either set it back to "0" before peddling or squeeze brake lightly to keep the power off until you are ready for it. Just a tip in case it helps. But they are terrific machines overall for the price. I would recommend them. Great bike to commute. Somewhat light, fast , nice brakes. Love the color and the step through. Just missing some suspension for the rough NYC roads!